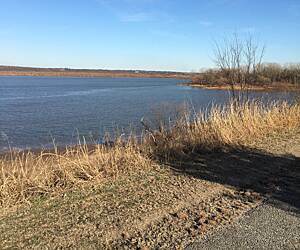 Looking for the best Birding trails around Ponca City? Find the top rated birding trails in Ponca City, whether you're looking for an easy short birding trail or a long birding trail, you'll find what you're looking for. Click on a birding trail below to find trail descriptions, trail maps, photos, and reviews. Watch out for the bridge! "July 7, 2005: Short but interesting. We started at the Cleveland Trailhead which gave us the best of the trail. First railroad bridge is paved with a railing on both sides. The second railroad bridge was another story and could have been fatal! It is the original bridge without the rails. You can ride on closely spaced ties without any railings. I went a little way out and decided it wasn't for me. Very difficult to stop and turn around as the front wheel can fall between the ties if you aren't careful - without railings this was frightening. My decision to turn back was wise because a locl told me later that people have been stealing ties from the Osage end of the bridge! I didn't actually see the missing ties and for that I'm thankful. It would have been a disaster to ride into an open section! 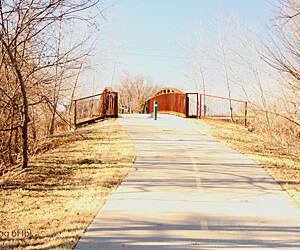 The trail was a nice short ride through varied landscape but don't cross the second bridge when you come to it!" This is a nice trail. Two side runs to the water. The first bridge was great but the second needs some work.